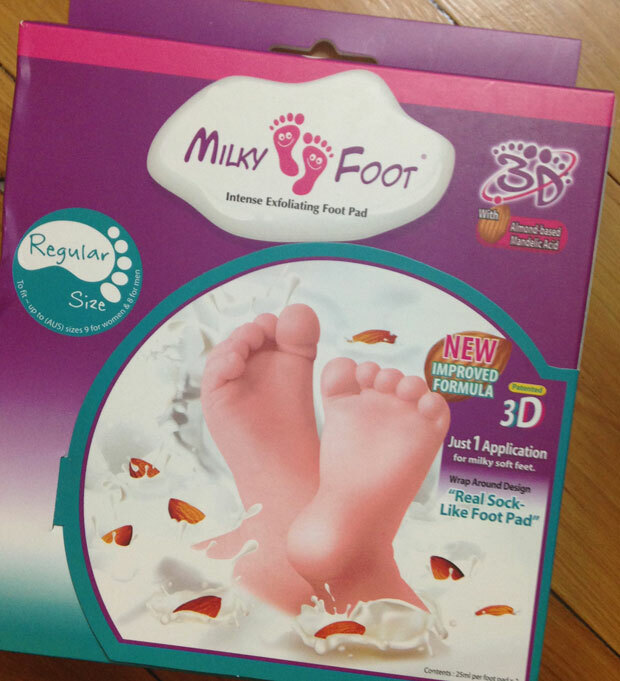 Milky Foot Review by my mum! A few weeks ago I was gifted a lovely little box full of treats from BioRevive. This little box was in fact a Summer Survival Pack, complete with a relaxing tea blend and scented candle – aaahhhh – and some products from BioRevive. You may not have heard of BioRevive, but you would have heard of one of their products – Milky Foot. 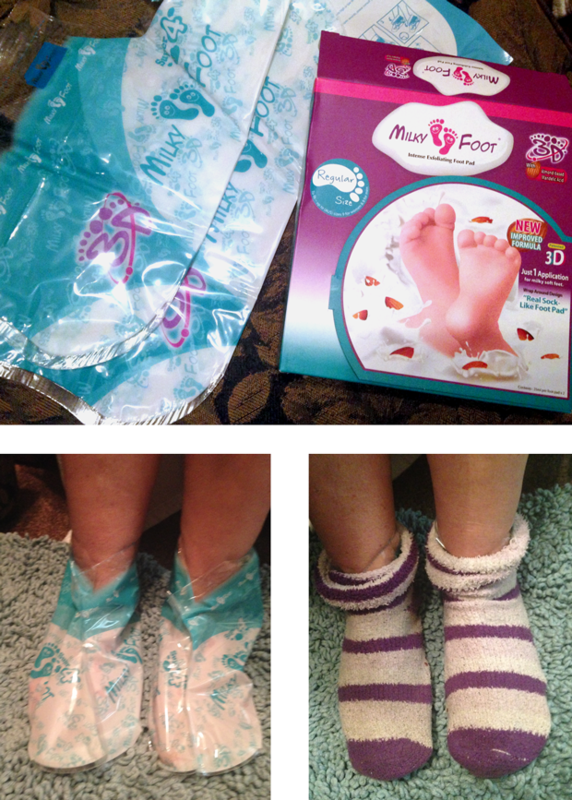 If you have ever seen Milky Foot and thought ‘I wonder whether that works?’ well I got my mum to try it out and here’s what she thought. It may be the advancing years, or the years spent walking barefoot or I simply lucked out in the lottery of beautiful feet but I have struggled for years to achieve the perfect ‘sandal foot’. Come summer time I would find myself constantly looking at other people’s heels to find feet in worse condition than my own….I rarely did. All it did was to reinforce the appalling state of my sorry hard skinned feet. Of course I had pedicures (apologies now to those long suffering beauticians) and tried various creams and foot rubs. I soaked and pampered but the results were only just border line and I continued to be very selective about social events that required heel exposure! So when I was offered the opportunity to try Milky Foot I jumped in boots and all….literally. As my daughter will attest, I am not easily impressed and having said that I have to admit I was blown away with the Milky Foot treatment outcome and the photos speak for themselves. The packaging is interesting and appealing to the consumer, the instructions simple, concise and not at all overwhelming. Resting comfortably…feet slipped into the plastic slippers provided in the kit which contain the gel that does the trick. No rubbing, no scrubbing just feet in the slippers, book in one hand and hot chocolate in the other. Now that is the way to pass and hour after dinner. After the hour a quick rinse off of the feet and oh! how I wish that peppermint smell would last forever. My feet look as ugly as they did to start with. I read the instructions and knew that to expect results on day two was heading towards the miracle category so my patience kicked in. My feet are drying a bit. They still look ugly, the skin still hard and cracked on the heel, but I am noticing white cracks on the soles of my feet. Looks like cracks in fine china….I wish! We have movement. The skin on my feet is starting to look exceptionally dry and brittle. I decide to soak my feet in the bath and help the process along. Skin is starting to peel and underneath is beautiful smooth skin. Has anyone ever got this excited about feet?? We have action sisters! Wow do we have action. I am zipping around with the dust buster picking up foot waste. After a shower and a scrub with an exfoliating glove the results are amazing and my feet feel…well they feel they belong to someone else. Just look at my feet…yes they are my feet! They are smooth… they are ready to party! 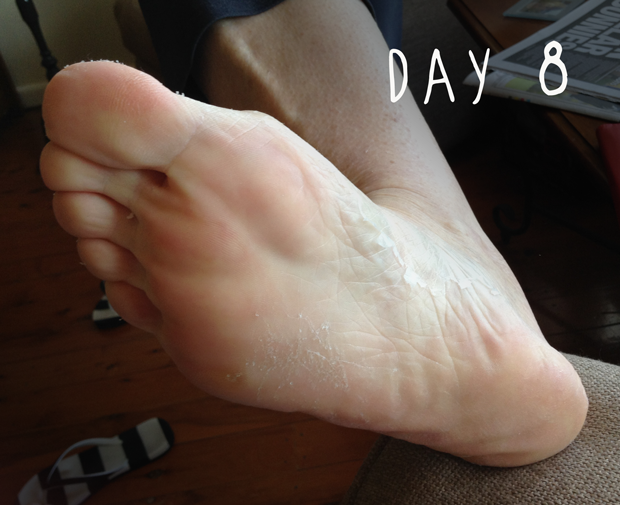 My feet are smooth…there is still a little flaking but some moisturiser fixes that. My Grandchildren no longer think I am a Ninja Turtle and I feel confident to break into a happy dance…. in my sandals. Milky Foot is amazing..it worked on my feet with remarkable results and if it can do that with my feet then it definitely gets the thumbs up. I could find no negatives for this product. Lovely to have a product that is painless and works.Just a word of caution if you want to smarten up your feet for a special event use Milky Foot about 2 weeks prior to the event. It is not an overnight fix. Thoroughly recommend and I will be going down this path again..not ever going back to those feet..
Well done Milky Foot and thank you…. A special note: always read and follow directions carefully as there are a few precautions listed including that Milky Foot is not suitable for pregnant women, children or people with diabetes or poor circulation. My mum was super impressed.